It is important to wash your face daily to maintain clear healthy skin and a glowing complexion. Equally important is what you use to wash your face with. Some facial cleansers are incredibly harsh and can end up harming the delicate skin on our faces, while others are weak and ineffective. If you've ever read the list of ingredients on the packaging of face wash, then you know they're chock full of chemicals and things you're likely unfamiliar with and can't pronounce. Sometimes less is more, and when it comes to our faces, the simpler the better. This homemade concoction has just two ingredients and you can mix it up tonight at home. In a small bowl combine coconut oil and baking soda and make sure to break up any lumps in the soda before adding in the coconut oil. 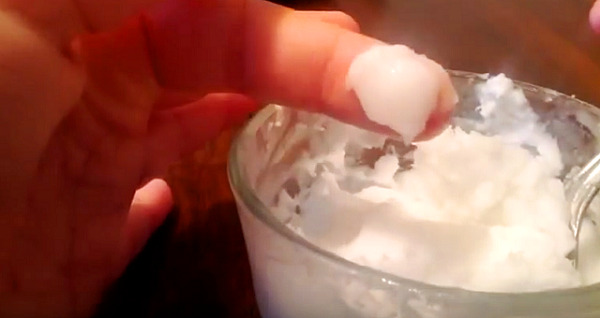 Coconut oil is a natural antibacterial agent and helps to unclog pores by fighting against and ridding it of germs. Baking soda works well at cleaning our skin because it's effective at regulating pH since it's not overly acidic or too alkaline, rather it falls right in the middle. After using this you'll notice your skin is smooth, calm, and polished. The combination of baking soda and coconut oil is effective at treating and fading acne scars, redness, and breakouts. It also works well at exfoliating rough, dry skin, leaving it moisturized and clean. Both ingredients are extremely affordable, natural, and they don't harm the environment like most of the ingredients found in conventional beauty products. Give it a try tonight before bed and see the results for yourself!